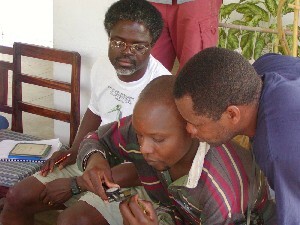 The first international AEWA-Afring Waterbird Ringing Course was held at Watamu on the central Kenyan coast, hosted at the A Rocha Kenya centre Mwamba. Photo D. Harebottle We flew to Malindi, a little north of Watamu on the Kenyan coast, on Friday 18 Sept. On Sat morning we explored the Arabuko-Sokoke forest, with Jonathan Baya as bird guide. We had great views of Sokoke Pipit and many other forest specials. Then Jonathan took us to the coast at Malindi to see some waders. Photo H.D. Oschadleus Most delegates arrived on Sat. 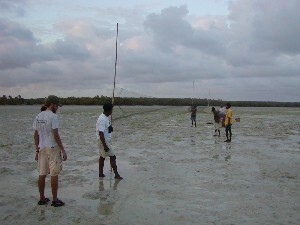 The trainees' experience ranged from no bird ringing experience to bush netting or tern ringing experience. 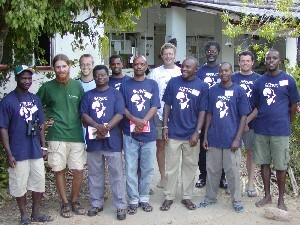 Left to right: Titus S. Imboma (Kenya), Simon Valle (Italy), Donall Cross (Ireland), Alfred N. Ali (Ghana), Sigawa Mgassi (Tanzania), Thade Clamsen (Tanzania), Colin Jackson (A Rocha, Kenya), Bernard A. Amakobe (Kenya), Samuel K. Nyame (Ghana), Wamiti Wanyoike (Kenya), Doug Harebottle (South Africa) and Hamlet Mugabe (Uganda). Photo D. Harebottle The course was hosted at Mwamba bird observatory and field study centre, which is the centre for A Rocha Kenya. Colin Jackson manages the centre. 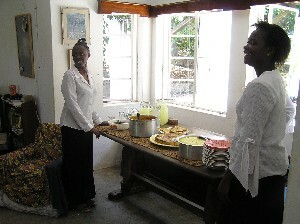 The wonderful local dishes were prepared by cooks Lisba and Nancy. Photo H.D. Oschadleus The course started on Sat evening with introductions of the delegates, and of the course. 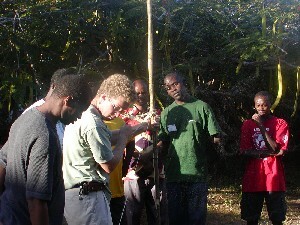 On Sunday we had a series of lectures, and in the afternoon nets were put up in the forest at Mwamba. Here Colin demonstrates tying knots on the net poles. Photo H.D. 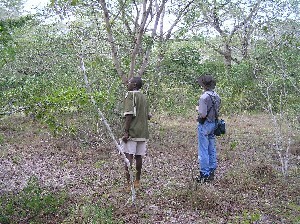 Oschadleus On Monday we caught forest birds around Mwamba to give the delegates training in daylight in extracting birds, ringing and measuring. Photo H.D. 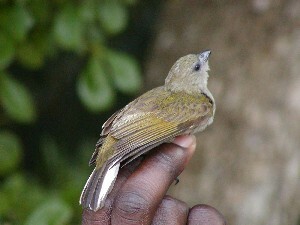 Oschadleus The most exciting catch was a Pallid Honeyguide, the first record for Mwamba, although it is known in the general area. Photo H.D. Oschadleus On Monday evening we put up mistnets on the mudflats of Mida Creek, a tidal inlet south of Mwamba. Photo H.D. 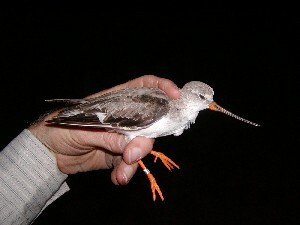 Oschadleus We caught and ringed waders until 11 pm. Photo H.D. Oschadleus We ringed several Terek Sandpipers. 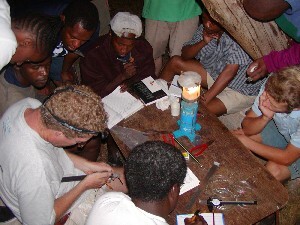 On Tuesday we slept late and had more lectures and prepared equipment (including walk-in traps) for the next day. Photo H.D. Oschadleus On Wednesday morning we ringed at Lake Chem-chem, an inland freshwater lake located about 20 km west of Malindi. 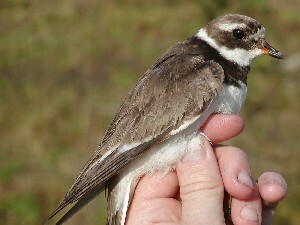 Ringed Plover was one of the species ringed. 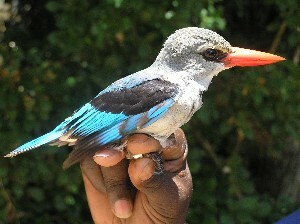 Photo D. Harebottle On Thursday morning we ringed at the Mwamba centre again and caught a Mangrove Kingfisher in addition to other species. Photo H.D. 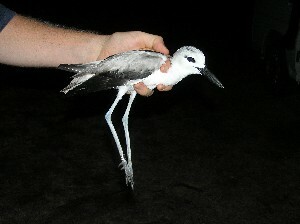 Oschadleus On Thursday evening we returned to Mida Creek for an all night wader ringing session. Photo H.D. Oschadleus The highlight of the evening was this Broadbilled Sandpiper. 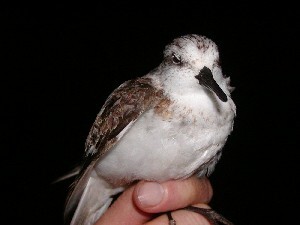 This was the first individual ringed at Mida Creek, and only the fourth for East Africa. Photo D. Harebottle Friday was time to sleep in and prepare for the second all-nighter. This time the highlight was a Crab Plover (an immature). Photo H.D. 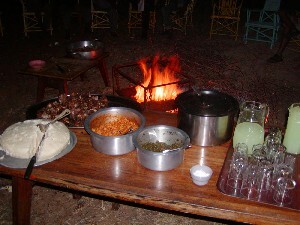 Oschadleus Saturday we slept in and that night celebrated with a traditional goat barbeque, and handed out certificates to all delegates. Photo H.D. 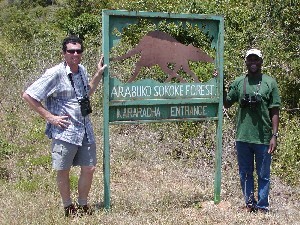 Oschadleus Sunday morning Doug, Dieter and Hamlet explored the Arabuko-Sokoke forest, with Albert Baya as bird guide. Early in the morning we again spotted the special mammal of the forest: Goldenrumped Elephant Shrew. Photo H.D. Oschadleus On Monday morning Doug and Dieter visited the Nairobi National Park, where we saw zebras, giraffe, rhino, and lots of other game. 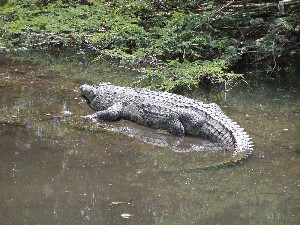 At Hippo Pools we could walk along the river where we saw this crocodile and lots of birdlife. African-Eurasian Waterbird Agreemnet (AEWA) for primary funding for the course. The Highlands Ringing Group , Scotland, for providing additional sponsorship. 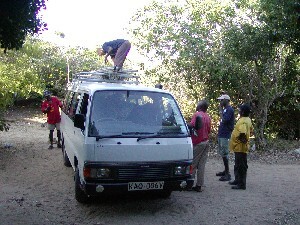 A Rocha Kenya , and the director of the Mwamba bird observatory and field study center, Colin Jackson, for providing the venue and accommodation facilities. Beatrice Kodhe , from the A Rocha Kenya office in Nairobi, for her assistance in organising travel and accommodation arrangements for Dieter Oschadleus and Doug Harebottle. 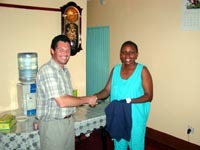 She is pictured here receiving an AFRING t-shirt from Doug as thanks for all her efforts.